How long will a chocolate Easter bunny last in triple-digit heat? In this video a bunny is hung in the direct sun while the temperature is hovering at 113 degrees Fahrenheit (45 degrees Celsius). Early on the chocolate rabbit appears to be sweating, but then the actual melting begins and the bunny gradually collapses into a blob of chocolate over a period of about six minutes. However, to make the video more viewable the melting is shown in reverse and significantly sped up. 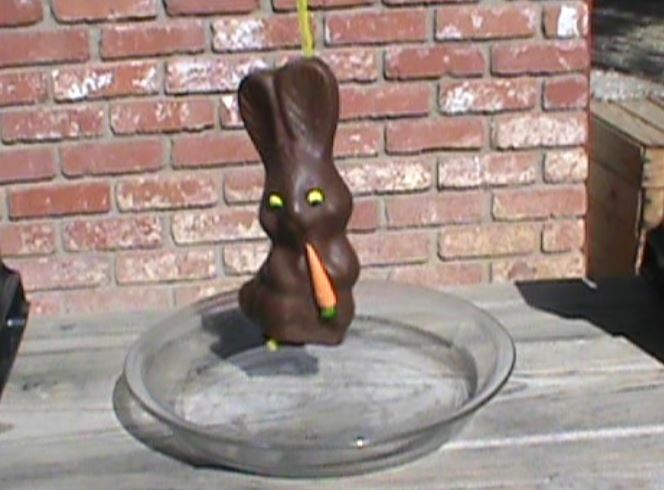 Last year I made a very similar video featuring an identical chocolate Easter bunny, but instead of hanging the bunny, I simply placed it on a plate. The problem there was that the bunny would not stand up after the melting began.